A Yemeni soldier stands guard in old Sana'a. The Cairo Institute for Human Rights Studies strongly condemns the Yemeni army's shelling in the Lawdar district in the Abyan province, Southern Yemen, which has severely harmed the civilian population located there. It is with deep concern that we observe the nearly week-long shelling campaign, supported by heavy artillery and tanks, which has prompted hundreds of Yemeni families to flee the Lawdar district and take refuge in the mountains as the authorities continue their military siege of the area, sealing off all entrances and exits. According to information received from Yemeni human rights organizations and other sources, at least three civilians have been killed and dozens more injured, among them at least two children, while the artillery fire hit a local market and severely damaged homes, agricultural land and a nursery. The assault was launched after several Yemeni troops were killed in an ambush by either al Qaeda operatives, as the Yemeni authorities claim, or elements involved with the Southern Movement. Exiled Southern Yemeni officials and leaders of the Southern Movement state that the attack was launched in an attempt to turn the international community against the peaceful Southern Movement by associating it with terrorism. It should be noted that the Yemeni regime used Yemeni fighters returning from Afghanistan to quell the rebellion in the south in 1994. Consequently, al Qaeda began to establish a base in the area, which later became the largest in the Arab world. The Yemeni authorities have persistently sought to stigmatize the popular protest movement and its leadership in the south as terrorists, in an attempt to justify the use of excessive force and increasing repression against citizens in the Southern provinces. The Southern province of Abyan has been the target of a series of brutal attacks over the last year. One of the bloodiest attacks took place in December 2009 when the Yemeni army, with support from the U.S. government, launched two air strikes on alleged al Qaeda camps. At least 42 civilians were killed in these raids, most of whom were women and children. Counterterrorism efforts against al Qaeda should not be used as a pretext for the international community to turn a blind eye to the grave abuses perpetrated by the Yemeni government against individuals suspected of affiliation with al Qaeda, or against the regime's political opponents. A noticeably large segment of the citizenry has become the target for various types of collective punishment in light of the militarization of the country and the civil strife being stoked by the regime in the Sa'ada region, north of Yemen, and the south to secure its monopolization of power. These very policies created such fertile ground for al Qaeda to grow in the Arabian Peninsula. Additionally, these policies have created an auspicious atmosphere for the recruitment of more terrorists and terrorist-sympathizers, both from inside and outside Yemen. The unconditional support given to the Yemeni regime by the U.S. administration and some parties in the European Union will only exacerbate the dangers of terrorism. Numerous individuals are swayed to terrorism on a daily basis, driven by their growing sense of injustice and injury, which is fed by the daily practices of extrajudicial killings; abductions; forced disappearances; torture; repression of peaceful protests; vicious attempts to silence the press and human rights defenders; the increasing political, economic, and social marginalization of broad swathes of the population; and the rampant spread of corruption, in addition to the spread and ascendancy of an extremist religious discourse fostered by the Yemeni regime itself. 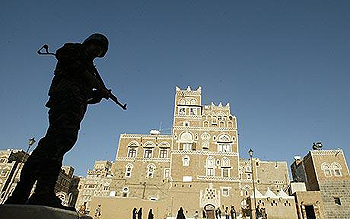 Averting the threat of terrorism requires concerted efforts by the international community to push Yemen to construct a rule of law, prevent impunity for grave human rights abuses, adopt an enlightened religious discourse, and refuse to sacrifice human rights under the justification of combating terrorism. Yemen's allies in the fight against terrorism must guarantee that the military, security and financial aid given to the Yemeni government is not used to perpetrate more war crimes and crimes against humanity, or violate the rights of suspected al Qaeda members or the thousands of Yemenis civilians who are paying a catastrophic price for the policies of the Yemeni regime, which threaten to bring about the wholesale collapse of the central state. This article was released by the Cairo Institute for Human Rights Studies: http://www.cihrs.org:80/english/.